How to organize CIFKM standard version in a company? On the one hand, any file downloaded directly from the server through CIFKM client program, when modified and saved at the PC it is automatically updated in CIFKM server. 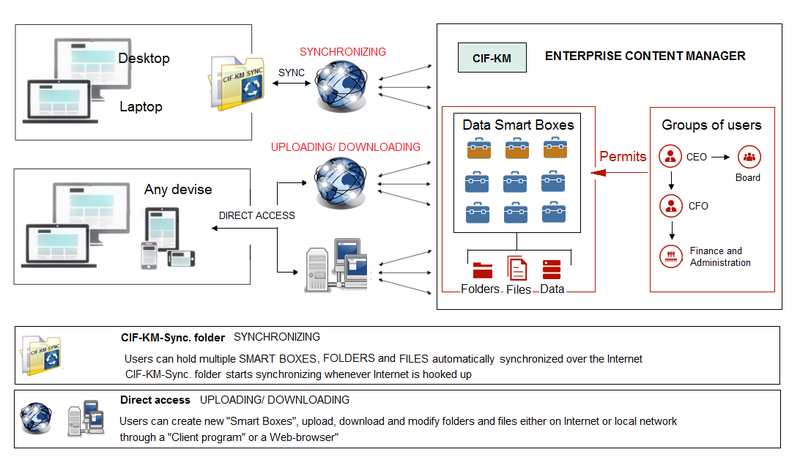 Furthermore, CIFKM users, with the client program CIFKM Sync, can also work at their PC synchronizing Data Smat Boxes, files and folders, with the server over the Internet. Sync is automatically performed any time when there is connection to CIFKM server. 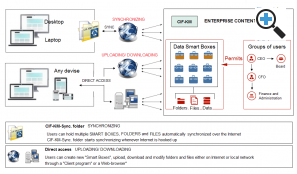 In CIFKM Sync" folder each user may hold multiple Data Smart Boxes, with part of their content (folders and files) constantly synchronized by Internet with their counterparts in CIFKM. How does users work in CIFKM? When connected to Internet synchronization is carried out automatically. Otherwise, it will resume, without one having to do anything, as soon as one has again connection to the server. Thus, all that is added or modified either in the local desktop or in the CIFKM server, will replicate bidirectionally between them. 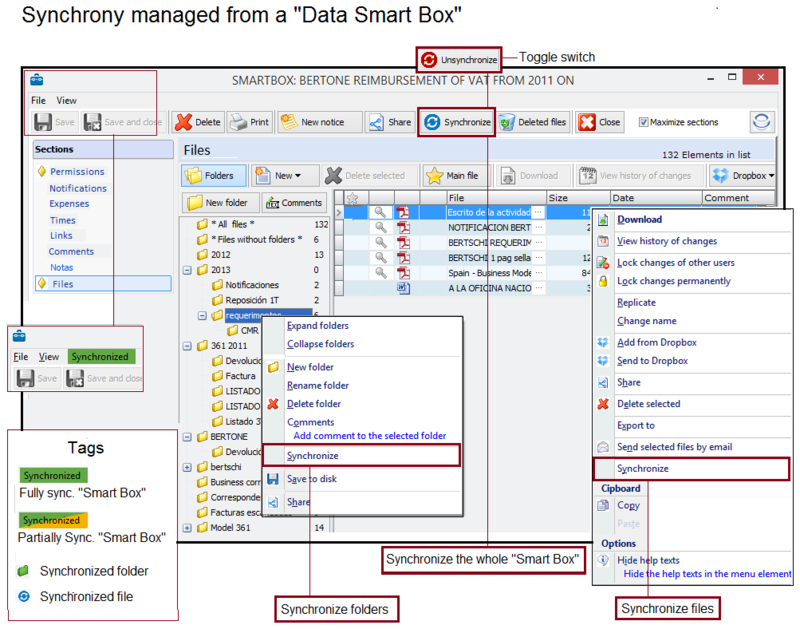 One should mention that CIFKM saves a "history record" of "Data Smart Boxes" and files in the server, so should any "Data Smart Box" or file be unintentionally eliminated it can always be recovered. Besides, it also has "check-in/check-out" functionalities that allow any user to apply "check-out" on a file and work over it being it locked preventing other user to do changes as lo as check-out is activated.. In other storage systems in the cloud, behind the scenes, there is only a simple BOX to keep a replica of the files and folders the user has in his PC. These systems of back-up and sharing with other persons are effective but only for one user or for a small groups of users. They aren't suited to business needs. 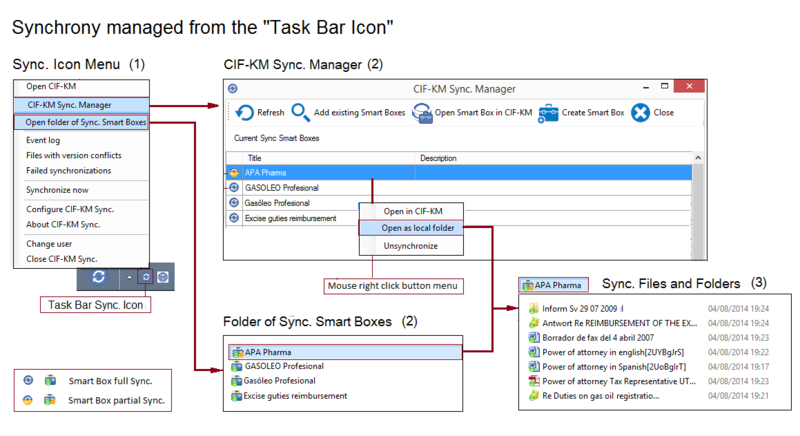 The big difference of CIFKM regarding these other back-up systems in the cloud is that behind the "CIFKM Sync" folder there isn't a simple container of files and folders, but the "Data Smart Boxes" of the Content Management System of the Company, created by the users; each "Data Smart Box" with its own design, functionalities, rules and permissions.